On 19 December last year, Kinshofer GmbH from Germany and the in New Zealand based Doherty Group signed a definite agreement to merge. Under the terms of the agreement, Kinshofer has acquired 100% of the Doherty Group. For over 45 years, Kinshofer has been a renowned manufacturer of attach- ments for truck mounted cranes, excavators and skid steer loaders, consistently developing its product range in both, the crane and excavator markets, to become a competent partner for OEMs and OEDs. Today it is a producer of huge high quality attachments for re-handling cargo or sorting and processing scrap, too. Previous acquisitions of Liftall Inc. (Canada), Demarec B.V. (Holland), RF System AB (Sweden), Auger Torque Group (UK/ Australia/China) and Solesbee’s LLC (USA) were other important milestones of this development. Kinshofer further demonstrates its commitment to being the global leader in attachments to the crane and excavator industry. Doherty, a 2001 established family business, puts its focus on the development and marketing of tools and equipment which make carriers such as excavators more effective and versatile, particularly important for small and mid- size contracting businesses seeking high utilization of its machinery. With an extremely committed and well-educated workforce, Doherty will continue to develop and sell its products globally. In order to meet the current market requirements, Doherty and Kinshofer will recruit more staff to ensure a swift and professional market launch of the companies’ products within either sales organization. Thomas Friedrich, President & CEO of Kinshofer Group, said: “Kinshofer continues its strategy to provide the industry with a ‘one-stop-shop’ solution of outstandingly engineered products to increase efficiency and, more importantly, profitability of our customers. 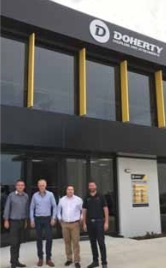 The acquisition of the Doherty Group was the next step in our approach to be a local manufacturer in New Zealand and Australia”. Kinshofer’s and Doherty’s employees are working on the rapid integration to provide customers worldwide with their comprehensive range of products and services. Jeremy Doherty will remain Doherty's Managing Director in the Kinshofer Group.